Definition at line 9 of file bdasup.h. Definition at line 17 of file bdasup.h. Definition at line 12 of file bdasup.h. Definition at line 96 of file bdasup.h. Definition at line 71 of file bdasup.h. 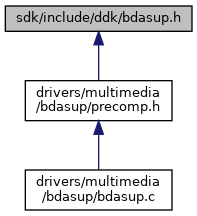 Referenced by BdaCreateFilterFactory(), and BdaInitFilter(). Definition at line 118 of file bdasup.h. Definition at line 220 of file bdasup.h. Referenced by BdaCreateFilterFactory(), and BdaCreateFilterFactoryEx(). Definition at line 180 of file bdasup.h. Definition at line 132 of file bdasup.h. Referenced by BdaMethodCreatePin(), and BdaMethodCreateTopology(). Definition at line 164 of file bdasup.h. Referenced by BdaPropertyGetPinControl(), BdaPropertyNodeTypes(), BdaPropertyPinTypes(), and BdaPropertyTemplateConnections(). Definition at line 172 of file bdasup.h. Definition at line 79 of file bdasup.h. Definition at line 156 of file bdasup.h. Referenced by CBDADigitalDemodulator_fnConstructor(), CBDAFrequencyFilter_fnConstructor(), CBDALNBInfo_fnConstructor(), CBDASignalStatistics_fnConstructor(), and CControlNode_fnConstructor(). Definition at line 88 of file bdasup.h. Referenced by BdaPropertyGetPinControl(), BdaPropertyNodeTypes(), and BdaPropertyPinTypes(). Definition at line 140 of file bdasup.h.